Do you have a tiny bedroom closet, or just have more stuff than easily fits into a standard-size closet? If so, you aren’t alone – both scenarios are among the most common reasons for bedroom dissatisfaction. One solution is to install – or hire a professional to install – a complete closet organization system. Unfortunately, not every budget stretches far enough to accommodate such a system. If you’re just looking for a few easy hacks that don’t cost much, take little time to accomplish and greatly increase your bedroom closet space, read on. Here are seven bloggers with clever closet hacks. Yes, you know that your daily soda habit is bad for your health, but at least the cans can help improve your closet. Want to double your hanging space? You’ll accomplish that in seconds with this great hack from Idea Bottle. Just twist off the little metal tab that’s used to open the soda can – remember to use it to open your can first, then you can enjoy the refreshing beverage while you whip your closet into shape -- and presto! You have a hanger-doubling device. 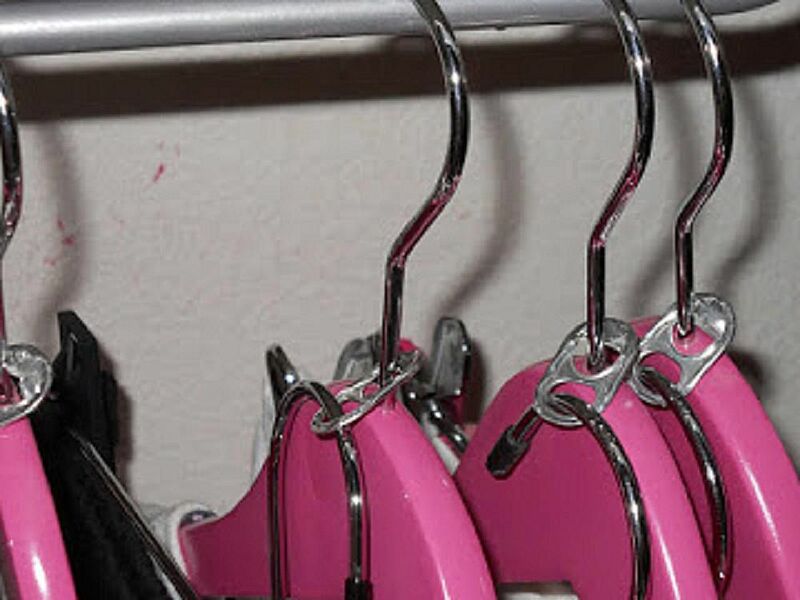 Just slip one of the tab’s holes over your metal hanger’s loop, and then hang a second metal hanger through the other hole. Now you can hang two garments in the space of one. What a great way to keep outfits matched. Is your collection of caps or scarves out of control? Send an old hanger and a few plastic shower curtain rings to the rescue with this idea from The Orderly Home. You’ll want the type of shower curtain rings that easily twist open – pick your favorite color. Simply twist several rings over the hanger – for fun, use a plastic hanger the same color as the rings – and now you have a handy cap holder. To use, just slip the cap’s strap through the curtain rings. It’s also a great way to store scarves, brassieres, small handbags, flip flops or just about any other clothing or accessory item that is easy to hang. Don’t you hate finding your tank tops, silky blouses or wide-shouldered tops crumpled on the floor of your closet after they slip from the hanger? Apparently, so does Jillee of One Good Thing, because she came up with these three great ways to create your own nonslip hangers. All you need are some plastic hangers and a few common household items. Twist pipe cleaners around the hanger near the bottom of the curve. Use a variety of colors to spice up your closet a bit. No pipe cleaners? No problem! Just grab a few thick rubber bands and stretch them back and forth over the bottom of the hanger curve. Voila, a nonslip surface! A thick scribble of glue is another way to keep your clothing on the hanger and off the floor. Use a hot glue gun or superglue to create a squiggle of glue along the side of each hanger. Make sure the glue is completely dry before hanging up your clothes! Suitcases are great when you’re planning a tropical getaway, not so much fun when they are taking up lots of space in your closet. Get them off the floor and out of the way by hanging them up high. Use large hooks or brackets – the type used to hang bicycles or similar heavy items. If you are careful to screw the hooks into wall studs, you can even use the suitcases to store out-of-season bulky clothing or sporting equipment and supplies that you only use occasionally. Is your reach-in closet more of a no-go zone? Many closets have considerable dead space on both sides of the door. If you have even minimal DIY skills and a power drill, you can eliminate that dead space and greatly increase your storage capacity by removing the full-length closet rod and replacing it with double rods on the closet’s sides, along with a shorter rod across the closet’s back. Get the full instructions at 320 Sycamore. Ah, peg board, so utilitarian and practical. Head to your local Home Depot or similar home improvement center and purchase a large piece of pegboard – measure the space where you plan on installing it so you don’t go too small or too large. If you’d like, add a can of spray paint to tint the pegboard a more appealing color. Don’t forget a selection of hanging hooks as well. Now all you have to do is screw the pegboard to your closet wall or the inside of the closet door, and hang your accessories, jewelry, shoes and handbags up and out of the way. Check out Evolution of Style for the full scoop. Have you been wondering what to do with those vintage wire baskets, woven baskets or small wooden boxes? Well, wonder no longer, because Décor Fix has the answer – attach your baskets to your closet wall or the inside of the closet door, and use them to hold small accessories, shoes, purses or whatever else you fancy.